Goldfish can live for well over a decade. 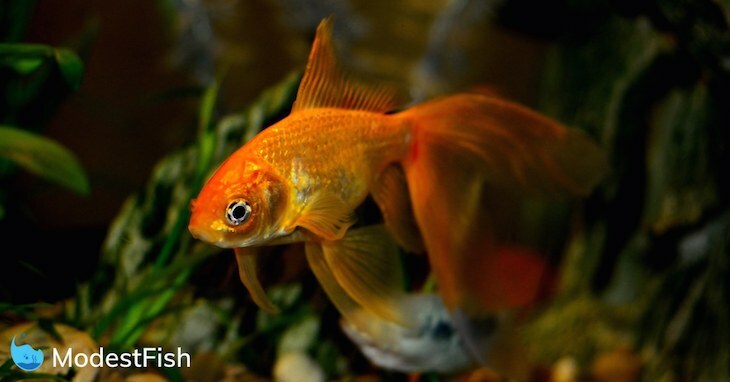 In fact, the oldest Goldfish ever recorded was 43 years old! But, the harsh reality is, most never get to live out their full life span. Because the majority of owners don’t understand how to properly feed their fish. And honestly, it’s not really their fault. There’s too much bad information available, which ends up in Goldfish becoming sick and dying. And you know what, once you know the how, what, and why, it’s not hard to provide your Goldfish with a diet that enables it to live a long and healthy life. Which is what I’m going to share with you in this article. You’re going to learn what the best Goldfish food is, and the exact feeding formula you should use to ensure your buddy’s around for years. 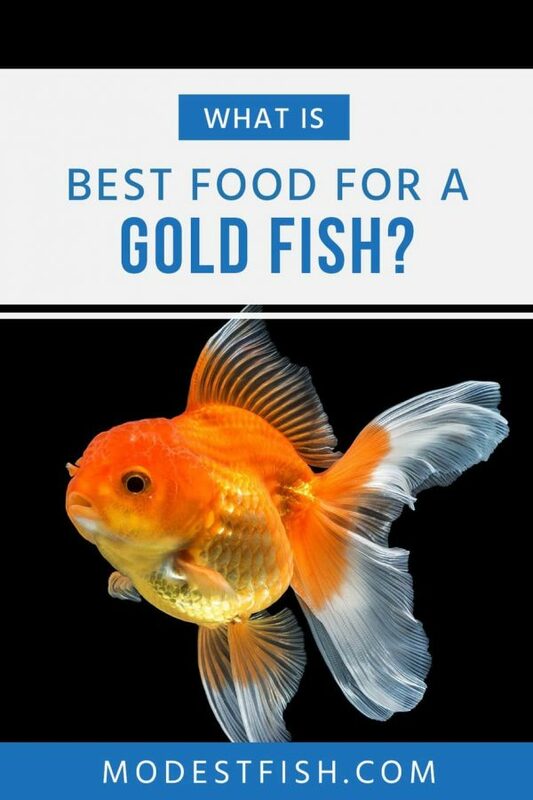 What’s The Best Type of Goldfish Food? Let’s get this out of the way: no one type of food will provide your Goldfish with the diet it needs to thrive. Rather, you need to provide your Goldfish with a balanced diet. 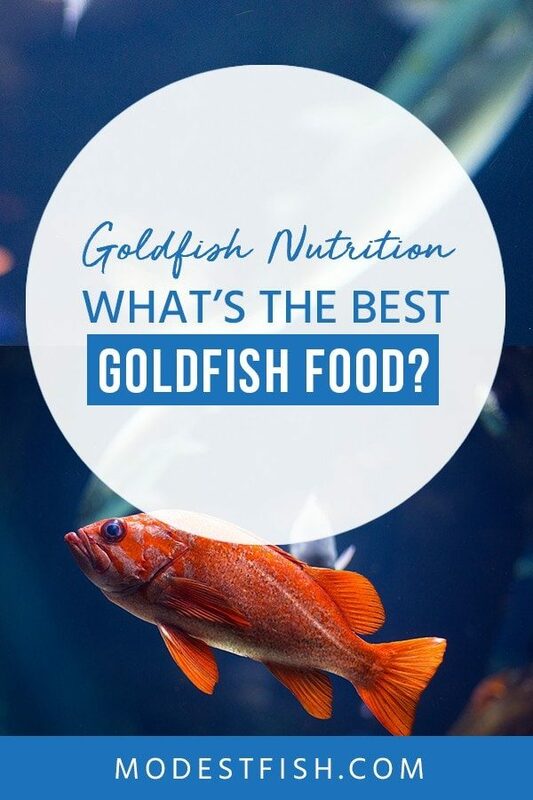 And the best way to provide your Goldfish with a balanced diet, is to understand what dietary requirements it needs to stay healthy and disease-free. Goldfish are omnivores. In the wild, they’ll eat crustaceans, plants, insects, some will eat smaller fish. Obviously, it’s not easy for you to completely match their natural diet. Instead, what you need to do is provide your Goldfish with foods that mirrors this natural diet. 1. Get high-quality made Goldfish food: This is going to provide your Goldfish with the proteins, fats, and other vital vitamins and minerals it would get in the wild from insects and smaller fish. Don’t get Goldfish food containing fillers, wheat/wheat gluten, or land animals. Your Goldfish is unable to digest these. 2. Supplement with vegetables: This will give your Goldfish the fibre it would normal get in the wild from eating plants and crustaceans. But, not just that. Goldfish have very sensitive digestive systems. They don’t have stomachs. I’ll discuss this in more details later, but for now, you need to know vegetables make it easier for your Goldfish to digest its food. Now you know what your Goldfish needs to stay healthy, avoid disease, and flourish. You’re probably wondering which foods are the best for providing this diet–yes, one is better. We know a balanced diet between high-quality made Goldfish food and vegetables is key. But, which commercial Goldfish foods and vegetables are the best. Let’s go back to the wild. Here, everything Goldfish consume is generally soft and moist, so their digestive system has evolved to process these foods. Remember before, when I mentioned Goldfish don’t have stomachs? This means different parts of their intestines do the job of breaking down food and absorbing nutrients. The result? Food can’t be stored for long and it’s processed much faster. Because of this, soft, moist foods are easy for your Goldfish to digest. Which brings me to the best type of made Goldfish food–Gel Food. Fall apart as they hit the water. Hard to tell exactly how much you’re feeding (huge problem we’ll get into later). 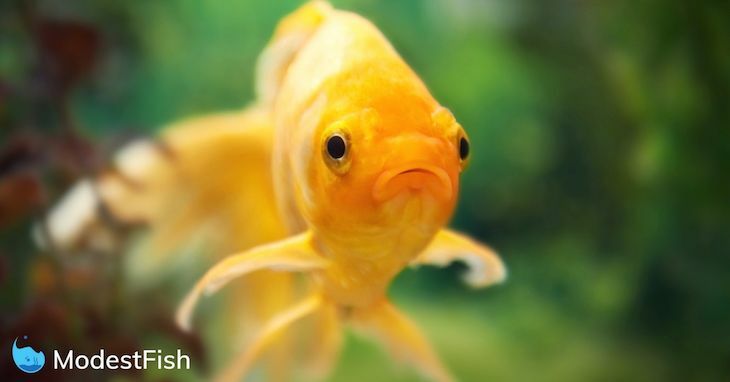 They float, so your Goldfish might inhale air when feeding–causing digestive issues. Lose some of their nutritional value after the tub is opened and exposed to air. Common for companies to use filler ingredients. Did Goldfish start the gluten-free diet fad? I’m not sure, but, they were doing it before it was cool. Grains aren’t a part of your Goldfish’s natural diet, so you need to avoid these. Rice, corn, barley, wheat flour, whole, wheat, or any wheat should not be fed to your Goldfish because they can cause digestive issues. You may or may not have seen the ingredient “fish meal” listed on Goldfish food before. This is all the unwanted leftovers from processed fish (bones, fins, intestines, scales, etc. ), smushed together–yeah, me neither. What you want to do, is choose brands which have “whole fish meal” or tell you which fish it came from. These brands provide a much healthier meal for your Goldfish. Goldfish don’t eat land animals, so it shouldn’t be in their food. It still blows my mind companies still add this stuff. If it contains any kind of beef, chicken, pork, even egg etc. avoid it. Their protein needs to come from underwater animals, like shrimp or krill etc. How Much and How Often Should You Feed Goldfish? Get this wrong, and you’ll be putting all of the inhabitants in your tank at risk. Your Goldfish’s natural instinct is to eat as much as possible because they’re foregors. In the wild, they’ll chow down on as much as possible to create fat reserves for when food is scarce during winter months. But, you’re Goldfish isn’t in the wild, so doesn’t experience leans times. If you overfeed your Goldfish with foods rich in protein and fats, it puts them at risk of disease as too much fat will build up around their organs–causing a fluid imbalance. This can then result in your Goldfish developing Dropsy. And the dangers don’t stop there. High ammonia and nitrites: Excess fish waste will cause a spike in ammonia and nitrites, which ware very toxic to your fish. Decreased oxygen levels: When your fish’s waste decays, it uses an aerobic process. This means it uses up the dissolved oxygen in the water your fish need. 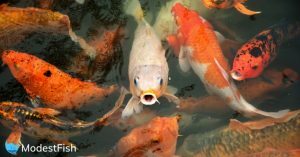 Increased stress and disease: Poor water quality will stress your Goldfish, causing its protective slime coat to weaken and become vulnerable to parasites and diseases. Bad Smells: All the extra decomposing waste is going to leave a nasty smell coming from your tank. Algae Blooms: They’ll thrive in the nutrient rich environment caused by overfeeding and excess waste. It’s true, algae isn’t 100% bad for your aquarium. However, it’s unsightly for most and if left to its own devices, can choke your plants. Extra Maintenance: Your filter system will become clogged with excess waste, disrupting the nitrogen cycle further. You’ll have to unclog your filters and perform more water changes to account for the excess waste. None of the above sounds fun, right? No. It’s true, your Goldfish will keep eating if you feed it this way because of their natural instinct to eat. But, you’re not doing them any favors because the excess waste is the number one cause of dangerous water conditions. Stick to a feeding routine, and aim to feed your Goldfish for approximately 30 seconds a day. This is going to be enough time for them to get the nutrients they need. However, they’re still going to be begging you for food. It comes back to their natural instinct to forage for food. Because they’re not eating, they think they’re starving and need to eat–but they’re not. The pellets/gel food insure they get the nutrients and the greens give your Goldfish something to forage on throughout the day and keep everything moving through their intestine. You’ve got plenty of options here. You can try providing some aquatic plants for them to pick at. Anacharis, duckweed, water hyacinth, and others are all good options. However, this brings a new set of problems. Your Goldfish will probably ruin the plants by plucking off leaves and roots. And it can become hard to provide enough space and light for your plants to grow faster than your Goldfish can consume them. So you’ll need to regularly replace them, bringing another set of problems. Introducing new plants increases the chance of contaminating your aquarium with unwanted pests. Meaning you’ll have to do extra work by quarantining new plants and giving them a dip or bath in a chlorine bleach solution. This is likely to kill any pests, but, there’s also a high chance you can kill the plants too. My recommendation? Use leafy greens from your fridge. Lettuce, turnip greens, and spinach all work well. Basically, any fibrous veggies will do. However, you are now going to have to deal with rotting vegetables. Which is why I recommend you use veggie clips. They ensure you doing have to pick rotting plants from the bottom of your tank and make it easy to replace them. Don’t expect you Goldfish to chow down as soon as you place the greens in the tank. They’re just not as yummy as the gel food. Stay strong, don’t feed them pellets–they’ll soon learn to eat them. Keep reminding yourself, you’re doing what’s best for them. Pro Tip: Microwaving the greens for a few seconds will wilt and soften them up, making it easier for your Goldfish to eat them. Making sure everyone gets their fair share can be tricky. Which is why I recommended hand-feeding your Goldfish. It’s true, it can take a bit of time an patiences to get it right (depending on your Goldfish’s intelligence). But, it makes the feeding freezing SO MUCH easier to control. So don’t give up! It’s well worth the effort. A common question asked in the community. 1. Buy an automatic fish feeder. 2. Ask a friend, relative, or neighbor to feed them while you’re away. However, both come with downsides: your automatic fish feeder could malfunction and dump too much food into the tank. Your chosen carer may feed your Goldfish too much food or forget one day and then think they need to feed more the next day. However, there’s a third choice: just leave them be and don’t feed your Goldfish. This might sound mean, but, your Goldfish will be fine without food for 8-14days. My recommendation, if you’re going away for 2 weeks or less–leave your Goldfish be. If you’re going to be away for longer, I would suggest you invest in a high-quality automatic feeder which is unlikely to break. Going to be away for a very long time? I suggest finding a human you can really trust to feed your Goldfish properly. Remember, it’s up to you to ensure they know exactly what to do. Can a Goldfish Eat Betta Food? Can a Goldfish Eat Tropical Fish Food? Now, the answer to all of these questions is, yes. but, no. Your Goldfish is will eat anything. It’s what they do. The problem here is the question: what else can my Goldfish eat? It’s not a matter of what else can it eat, rather, what else could I feed my Goldfish? And honestly, as long as you’re feeding your Goldfish quality gel food and greens, you don’t need to feed it anything else. Peas: A common treat many hobbyist use, make you’ve removed the skin before you feed. They’re easy to digest, however they are a bit high in protein so don’t feed too much (your fish get the protein from gel food). Blanched broccoli or zucchini: Both can serve as a healthy snack and provide the fibre to supplement the gel food. Downside is they can get a bit messy. Live (or frozen) food: Insect larvae, mosquito larva, daphnia, brine shrimp and bloodworms are all digestible and rich in protein. Use these sparingly to supplement your fish’s protein diet. Freeze-dried food: These are usually found in pet stores and can be used as a treat. Bare in mind, these are very dry (not good) and it can be hard to tell exactly how much your feeding your Goldfish. 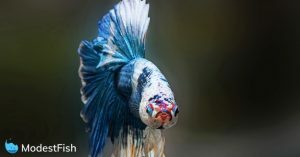 If you take away only one piece of information from this article, it’s this: overfeeding is the cause of most problems Goldfish owners face. I find it’s best to keep things simple. Feed your Goldfish high-quality gel food for 30 seconds a day and supplement with greens. Once you’ve nailed your routine, then start providing some nice treats for your buddy. Excellent reading. I have around 18 Gold fishes. Used to over feed. Your article has helped me and created an awareness. Thank you. This info is totally right on! I’ve been keeping fish my whole life. My 8 fancy goldfish are in a redundantly filtered 75 gallon tank. They get Repashy Super Gold Gel food (prepared adding 1 tablespoon of frozen daphnia to the mix in place of a tablespoon of water) every day. In the afternoon the have finely chopped softened vegetables (broccoli, peas, green beans & carrots are favorites). A couple times a week I’ll treat them with frozen brine shrimp or live food (mosquito larvae, blood worms, daphnia) collected from a stagnant water filled baby pool in the yard. They never get flakes or pellets. 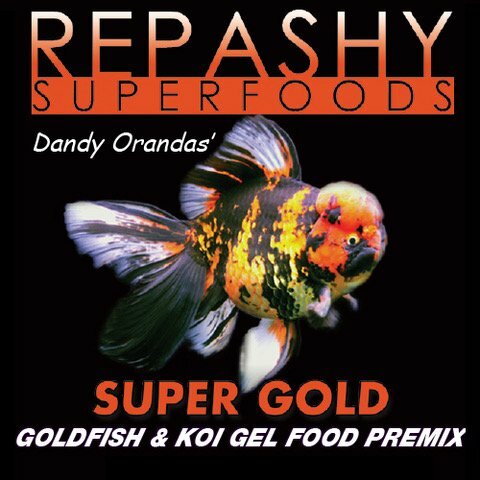 Repashy Super Gold is the ideal staple gel food!